THE ICONIC HM Bark Endeavour made its way into Whitby harbour today to the sounds of bells ringing out from St Mary's Church, a cannon salute and cheering crowds along the quayside. Whitby celebrated the arrival of the full-size replica of Captain Cook’s legendary ship, which arrived after a 40-mile journey from Middlesbrough. Many see Whitby as the Endeavour’s spiritual home as the original vessel was built in the town in 1764, and it is where Captain James Cook also began his sea-faring career. There are only two life-size replicas in the world, and the Australian-built version previously visited Whitby on three separate occasions in 1997, 2002 and 2003, but now the harbour town will have its own which will be moored permanently and transformed into a visitor attraction ready to open on July 1. 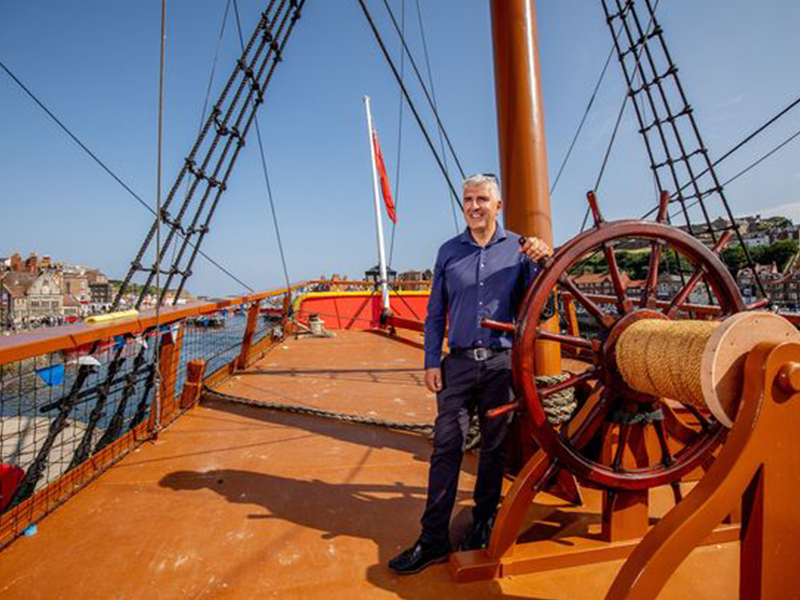 Owner and local businessman Andrew Fiddler won an auction battle to purchase the ship last August for £155,000, and said seeing her in Whitby harbour was very satisfying. He said: “I managed to secure her at auction amid lots of competition from countries around the world and the Royal Navy. “Our main aim was to keep her in the North East, and I think Whitby deserves to have her. “It has been a long journey, logistically. There have been a lot of challenges, and there have been times when I thought it wouldn’t be possible. The opening of The Endeavour Experience attraction will be all the more poignant as this year marks 250 years since Captain Cook set out on his epic first expedition to the Pacific in command of the Endeavour. The Endeavour’s journey began back in April when she left Stockton-on-Tees and had to be craned over the lock gates at the Tees Barrage to overcome her landlocked status. Since then she has been undergoing an extensive repair and restoration programme in dry dock and will now undergo a further transformation before opening as a family-friendly attraction just ahead of Whitby’s Cook anniversary celebrations. To complete the tall ship’s transformation, ex-Naval officer Mr Fiddler has appointed leading interpretive design specialists, Huddersfield-based Leach Studio Limited, whose previous commissions have included Tower Bridge, the Seaside exhibition at Scarborough Museums Trust and ‘Viking’ for York Museum and The British Museum. Through innovative graphic design, lighting and interactive features visitors will be transported back in time to life on-board the 18th century ship and learn just how Cook’s crew, numbering almost 100, coped during the three-year voyage including how they staved off scurvy and overcame boredom during those long days at sea. The attraction will also enable visitors to glean more about the expedition’s scientific discoveries. For instance how the astronomical phenomenon of the Transit of Venus improved navigational accuracy, and the wealth of strange new botanical and animal species collected as the explorers charted the coast of New Zealand and the eastern coast of Australia. Our main aim was to keep her in the North East, and I think Whitby deserves to have her. It has been a long journey, logistically. There have been a lot of challenges, and there have been times when I thought it wouldn't be possible. I'm sure it will be a visitor experience Whitby can be proud of. Welcome aboard! Converted Captain Cook replica opens in Whitby. Owner Andrew Fiddler has spent £1m turning it into tourist attraction:: It arrived in Whitby after being towed from Stockton. The transformed replica of Captain Cook’s ship HM Bark Endeavour is opening to the public in Whitby. 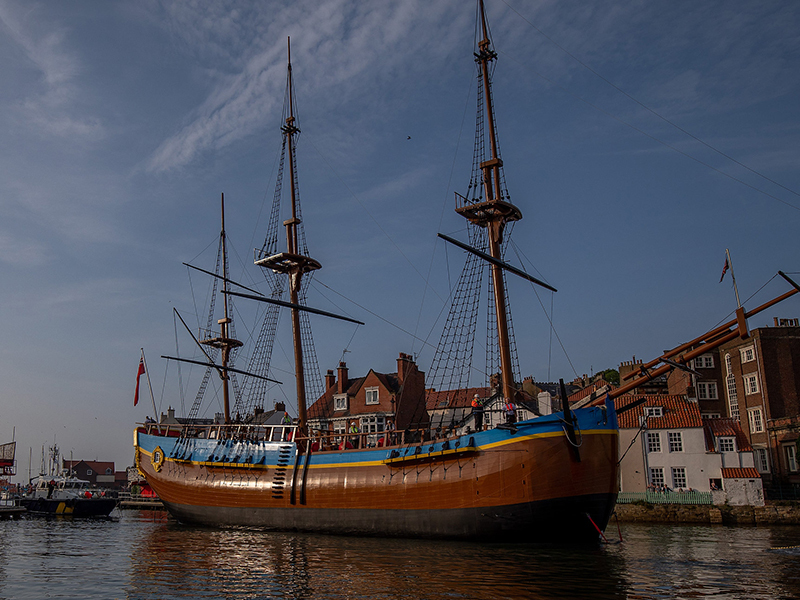 The next stage in the transformation of HM Bark Endeavour into a visitor attraction is well underway following its arrival into Whitby at the beginning of June. Voyage beyond the every day prices with discount offers when signed up to our newsletter. Copyright © 2019 The Endeavour Experience Whitby. All rights reserved.